#SWFL We adjourned. Thank you. #SWFL Lombardi says he's going back to retirement. Mayor Batos says he's jealous. #SWFL This is Peter Lombardi's last meeting as interim village manager. The council is praising his help launching village these past 7mos. #SWFL Councilor Errington has stopped asking Walmart for a park after a lot of confusion. "That was exhausting," she said. #SWFL Councilor Brown: They want to make a presentation to us about the Lovers Key environmental education center. #SWFL Councilor Brown: Lovers Key folks reached out to him in their attempt to get Legislature to help pay for education center at park. #SWFL Vice Mayor Levitan slipped in reference to the "There's no free lunch" quote. #SWFL Apparently Lee County offered Estero free services from an interior designer who is on the county payroll, per Councilor Ribble. #SWFL "Who is choosing the paint color?" Says Councilor Errington. Everyone laughs. #SWFL Estero's village council unanimously approves a lease for a new village hall. Brokered by Councilor Ribble. #SWFL No public WiFi at the Estero fire district again. Updates will be fewer. #SWFL Commissioner Kiker: Estero needs a permanent seat on MPO, it's been 10 months, whay so long? "We need to get this done." #SWFL Seeing all cities discussing with county is very interesting experience. I recommend it. #SWFL Ann Pierce, Lee resident: People she talks to who visit say coming to Lee County is like stepping back 20 years. 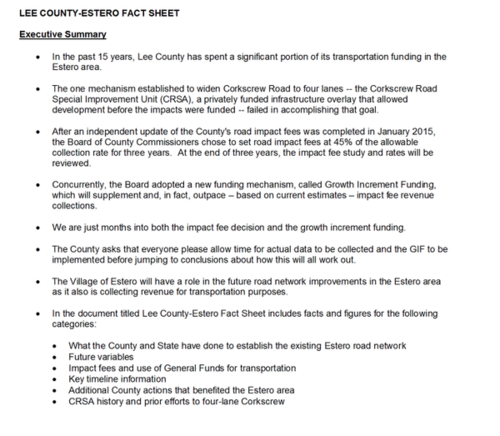 #SWFL True story: Lee County PIO sent me two documents with bullet points and info for when I write about Estero. Screenshots to follow. #SWFL ECCL Eslick up again: Estero among fastest growing areas; The amt of traffic generated has created a lot of demands for improvements. #SWFL Cape Coral Councilor Jim Burch called Corkscrew Road a "death trap." #SWFL "I think we should take care of what we have before we extend to new areas," Estero Mayor Batos. #SWFL Estero Mayor Batos: Paying to extend roads when you have existing roads that need work now isn't right. #SWFL Commissioner Pendergrass: Three Oaks Pkwy extension is a must to help with north-south traffic. #SWFL Lee's MPO voted to table the proposed five-year transportation program draft; Com. Hamman said no one seemed satisfied with plan. #SWFL Commissioner Kiker: They plan, they re-prioritize -- meanwhile needs list stays long: "I think this process is broken." #SWFL Bonita Mayor Nelson: It's going to take more money; said he's tired of just talking, moving projects around & not getting them done. 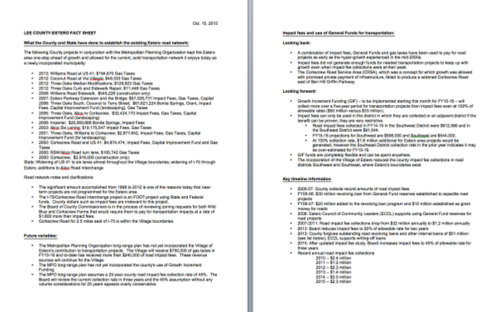 #SWFL As you can see, the transportation needs (and wants) list in Lee County is long, long long. 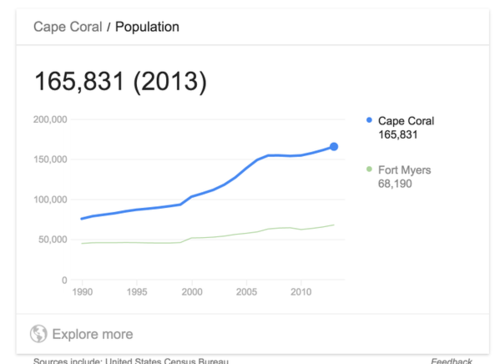 #SWFL Another Cape Coral resident: How many years will it take to get Cape Coral connected? ; How do we get out in a hurricane? #SWFL Cape Coral Mayor Sawicki brings up how Cape Coral has no direct connection to Interstate 75. At ALL. #SWFL Don Eslick, Estero Council of Community Leaders: We need Corkscrew Road-Interstate 75 interchange improvements ASAP. #SWFL I believe MPO just agreed to a motion that supports asking FDOT to look into SR82 Design-build-finance; but I have to verify.